Since weddings are a once in a lifetime event, many couples share the same level of cluelessness in every single wedding detail. Often times, the wedding planning process can get quite overwhelming especially when it comes to selecting the final list of suppliers. To help with your quest to find the perfect wedding gown designer, here is a list of questions that you must ask your wedding gown designer. With a few tips from popular wedding gown designer, Merlene Marcelo, you can be on your way to having the perfect wedding dress. 1. What gown silhouette will fit my body type? - Reputable wedding gown designer Merlene Marcelo cannot stress enough how important the fit is in a wedding gown. When a gown does not provide the right fitting, it will definitely show. The princess cut type of the gown flatters nearly every figure according to Merlene. However, the difference will lie in where the cut will be emphasized. There also might be features you want to either hide or emphasize. Make sure to ask about appropriate gown types for your body type to consider. 2. What shade will work well with my skin color? – These days, brides are no longer restricted to wearing pure white wedding gowns. Instead, brides are opting to go for champagne, cream, beige, ivory or even light pink colors. Feel to feel to experiment with different colors that will look best with your skin tone. 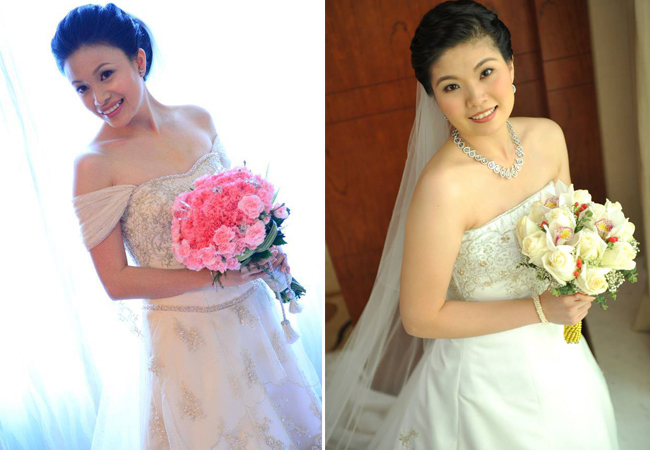 Your wedding gown designer would definitely know which color would suit you best. 3. How heavy will the dress get after all the embellishments? – Shining and shimmering every gown must be but many people have no idea how a gown weighs after all the embellishments are put in place. Brides are tasked to hundreds of wedding pictures while going around the venue entertaining guests. You wouldn't want to have a heavy wedding gown to lug around all day. Consider ways to make your dress a bit lighter such as a removable train. 4. How long will it take to make my wedding gown? – It usually takes a minimum of six months to make a wedding gown. However, the length of time will also depend on special details such as the embroidery and beading needed to complete the gown. But during instances when a gown needs to be rushed, Merlene and her team try their very best to accommodate such orders. After all, no bride should be left weeping a week before her wedding with a gown gone wrong. For the ultimate rushed orders, ready-to-wear bridal gowns that can easily be altered or embellished can be done in a week's time. 5. How many gown fittings will there be? – Booking a designer and drafting designs can take at least a year before the wedding. However, a lot of changes can happen to your body in just a few months time. The good thing about having multiple gown fittings every few weeks is that you can monitor the progress on your gown. In case something does not fit right, the problem can immediately be addressed before they move to other aspects of making the wedding gown. Try to squeeze in a reasonable number of fittings until your wedding day to make sure you are getting the wedding gown you exactly want. You might also want to bring the underwear and shoes you will be wearing on your actual wedding to help you get a clearer picture of your whole wedding ensemble. 6. How much will the gown cost? – The cost of the gown is usually one of the more important considerations when choosing a wedding gown designer. Make sure to stick to a budget that is reasonable enough to make your dream wedding gown. Aside from being able to produce quality gowns with intricate beadwork designs, Merlene Marcelo offers her services at affordable prices. Producing a wedding gown is a step-by-step process which is why changes may incur additional costs along the way. It can help if you get a breakdown of costs to identify alternative materials that can look just as nice. Merlene then makes sure to discuss options on how she and the client can meet halfway with regard to the budget. These are just a few important questions that many brides forget to ask when looking for a wedding gown designer. Learn more about the designs, work and reputation of Merlene J. Marcelo on her Kasal.com profile page.